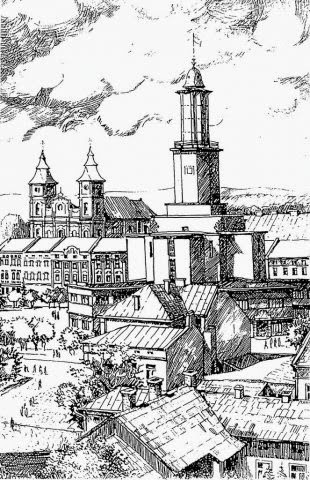 According to the official data, on March 21, 1662 Stanislaviv got the right for conducting trade fairs, and on May 7 the same year got the status of the city with Magdeburg rights. Andriy Pototskiy assumed to be the founder of the city. For more understanding of the history of the city, we give the fact that its owners were the Pototskies: Andriy (1661-1691), Yosyph (1691-1751), Stanislav (1751-1760), Vincent (1761-1770), Yosyph (1770-1771), Kateryna, one of the Pototskies, Kossakovska (1771-1792), Prot Pototskiy (1792-1801). In 1801, Stanislaviv became the property of Austria, and in 1848, it was bought back by the right of the former owners. Thereupon it got the title of Free Kingdom City. The main stage of development was during the governing of Andriy and Yosyph Pototskiy. At that time the formation of Stanislaviv as a fortress took place and main buildings (the part of which we can see nowadays) were erected. In 1732 the population of the city was 3321 people. The first city architects were engineers François Korassini from Avignon and Karol Benoe. The building of every medieval city began with fortification strengthening. Ivano-Frankivsk was not an exception and it was to be built according to François Korassini s plan of “The Ideal City” in 1672. The notion that was influenced by the Renaissance style in Western Europe, especially in France, meant the creation of such a variant of city fortification that would be well protected and have quite a lot of places for population security and beating off the attacks of the enemy, would also have convenient placement of living areas and sacred buildings. There were only few such cities in all Europe. It was connected with the fact that the city was to be built on empty place or on the place devastated by foreign enemies and this required many expenses for its building. There were only three such cities in Ukraine – Zhovkva, Brody and Stanislaviv. Using the “Diary” of Ulrikh Fon Verdum (a famous European traveler of that time), we know that the city of that time in 1672 was situated on a flat square on the place of former Ukrainian village Zabolottya. From three sides the city was surrounded by lakes and bogs through which the small Bystrytsya River ran, flowing in to the city ditch. Fortification consisted of six strong bastions on the lower side of which was palisade made of oaks. There was a wooden Roman-Catholic church where masses took place until a beautiful stone church (nowadays a Fine Art museum) was completed. Armenians, Russins and Greek-Catholics had also their own church per each community. The city Town Hall was in the center of a market square. Voyevoda (a governor of the province) established a high school with five professors when he lived in a wooden castle of that time. However, construction of a big palace made of stone which was to be erected in the southeast part of the city (now Shpytal’na Street) had been planned. Voyevoda wanted to make it with towers and other fortifications as a citadel. Such was Stanislaviv city at that time. Nowadays only one bastion fragment of the powerful medieval fortress is saved (Fortechnyy Side-street). From the mentioned above temples only one has been preserved – The Immaculate Conception of God’s Mother Collegiate Roman-Catholic church, designed by the project of Korassini and Benoe from 1672 to 1703. It was built in Renaissance style in the form of a cross. The church is a family tomb of the Pototskis. Andriy Pototskis son of Yosyph decorated the Catholic Church after his father s death. In 1721-1737 he did everything to enrich the interior of the church. By 1737 masters Thomas Gudder and Konrad Kutchenrayter from Bavaria set luxurious side altars in Baroque style there. Decorative Rococo style architectural details were also done. In 1877, a famous artist Fabiyanski Rudolf Erazm painted the interior of the church. Above the main entrance, where the choir loft is, there was a very melodic organ. One could hear it first on November 11, 1900, when professor Tepfer from Dresden played the organ. From May 18, 1980 the Catholic Church has become a Fine Art museum. The most valuable things of religious honor in the church were relics of St. Vincent. Stanislav Pototskiy brought the relics in 1679, who soon after that died at war battle under the rule of king Yan III. Saint relics “…got Stanislav begging the Pope Innokentiy XI during his trip to Rome”, as his brother Yosyph Pototskiy wrote in the preserved Act of the 18th century. According to the later document, Stanislav Pototskiy asked the Pope Innokentiy to give him St. Vincent relics that were taken from Roman catacombs. In the Catholic Church in Stanislaviv, there were also relics of saint martyrs of Yevstahiy, Florian and Mavrytsjy. Nevertheless, St Vincent’s relics were known for its miracles. According to the priest Baronch everyone who came there with faith and had some anxiety or trouble felt much relieved. Even come-and-go people trusted this place and glory about unusual events connected with the relics made St. Vincent known as a patron of Pokuttya. Now let us have a look at some miracles that are also a part of that time life in Stanislaviv. The first one happened even before the relics came to Stanislaviv. After getting a valuable gift from the Pope, Stanislav Pototskiy went to Poland by sea. However, during his voyage one event had happened which was described by his brother Yosyph in such a way: “in the hold of the ship there was gunpowder; and the people were careless with the fire and that was the reason for explosion. Nevertheless, my brother and some people with him who were standing near saint relics were saved while others were burnt by fire and drowned. So my brother with the people having been saved by fishermen went successfully to the shore with St. Vincent’s relics which were brought to our city”. This event was described in some historical essays and the poem by Romanus de Gouge. This poem gives an exact place of that disaster. It was near village Willebroek not far away from city Mechelen in Belgium. Saint Vincent’s relics were rather approachable, but sometimes one could not easily get to them. Head was rarely given to be kissed. Instead, the mass took place above the head of the martyr. Polish proverb “In anxiety people turn to God” in Stanislaviv sounds as “In anxiety people turn to St. Vincent”. From 1747, information about St. Vincent’s miracles was lost. However, the whole city gave honor to this martyr. Now let us go further. We can see the building where priests used to live who had masses in the Roman-Catholic church (now 41 Halytska Street). When we turn to the central part of Halytska Street we will face one of the oldest city buildings – the Roman-Catholic church hospital, which later became the house for poor. Now it is a house building (14 Halytska Street). This building was erected approximately in 1737. Having a look at the crossways of Halytska – Novhorodska 1 Dnistrovska streets let us close our eyes and imagine that we see a famous The Galician Gates, a bridge across the ditch and exit out of the city. Nowadays a trade center “Merkuriy” and pavement are on the part of the gate base. Now let us have a look at a newly built house under number 1 on Trinitarska Street. One of the first wells which supplied the city with the water is based under this building. The well had been discovered in 2001 when an old building was destroyed. An interesting thing is that there was still water in the well. Its depth was 8.5 meters. Resently it was filled up by 16 m3 of concrete. From 1732 to the first half of the 19th century on Trinitarska Square there used to be the Roman-Catholic church of Trinitariy monks and convent which are preserved to our days (2 Starozamkova Street). After the closure of the convent, the building was used as a court and jail. An interesting fact is that there are some tunnels under the building. Using one of the tunnels one could get to the City Tower. According to the legend, criminals went through this tunnel to be executed. One of the important attributes of the fortress is a palace. Until our days, an essential element of the Pototskis’ palace (designed by Karol Benoe in 1682) is the main entrance gateway. In the far side of the complex, there is a three-storeyed building where the Pototskis lived, and some other buildings that are now fully rebuilt. So what was interesting connected with this palace? The guests of the palace were such famous people as Polish king Jan Sobieski, Transilvanian prince Ferenc Rakoczi. According to the as¬sumptions of ethnographer, M.Holovatyy there used to live Anna the wife of the Ukrainian hetman Pylyp Orlyk who was in exile and was an author of the first constitution of the Ukraine. She emigrated with her husband after the defeat in the battle near Poltava. She lived under the guardianship of Yosyph Pototskiy, who was her husband’s ally from 1732. A story that came across all the publications about Ivano-Frankivsk concerned Yoseph Pototskiy s funeral, which in 1751 was visited by many people. Commemoration was very pompous. During only one dinner, 20 barrels of Hungarian wine and 11 barrels of champagne were spent. Menu of the event was so delicious that all tables with food couldn’t be placed in the palace and the most sincere weepers lived there for three months. Near side gates of the palace one can see small metal round forms. Some people said those were digged cannons. However, in fact those things were used to support the chains that were elements of the mechanism of opening and closing of the gates. One of the most progressive medieval streets in Stanislaviv – Virmenska Street which takes you to the former Armenian church, nowadays The Ukrainian Autocephalous Orthodox church. According to some sources, this street was among the first one to be paved in Stanislaviv. Armenians used to live on this street and on modern Melnychuk Street. In 1665 a wooden Armenian church was built where constantly conducted religious services. On August 22, 1742 the icon of God’s Mother started to shed tears there. After that many evidences about miracles had arose that happened near the icon. From 1742 to 1762 a stone church was built exactly for this sacred image. It came to our days and preserved a lot of valuable sculptures made by Matviy Poleyovskiy who was the follower of famous Johan-George Pinzel’. There were also saved Tan Soletskis frescos, which after unsuccess¬ful renovation are nowadays covered by bright paints. In 1938, the Pope crowned the icon. The divine worship on this occasion lasted 44 hours. In 1946, the sacred image was taken to Gdansk, which is still there, and on the facade of the church, we can observe the copy. We will finish our excursion through medieval Stanislaviv in the cathedral of St. Resurrection, which is the main Greek-Catholic church in the city. It was built in 1753-1763. An interesting fact is that in different times it was a sacred place for all Christian confessions of the city. In 1763-1773, it was the cathedral for Jesuits, from 1849 to 1946 and from 1990 until our days, it is a Greek-Catholic cathedral, and in 1946-1990, it used to be a Russian Orthodox Church. Despite this polyconfession the cathedral successfully illustrates the canons of interior decoration of the Orthodox Church. The most magnificent thing in the church is the five levels iconostasis made in 1901 by such famous Ukrainian masters as Y. Makarevych, A. Monastyrsky and M. Sosenko. Names of many famous Ukrainian people are connected with this cathedral. First, let us mention bishops of Stanislaviv eparchy that was opened in 188S. Among them, there was Yulian Pelesch, a famous historian and theologian, who was the first bishop, two metropolitans Yulian Sas-Kuilovsky and Andrey Scheptytsky who also were bishops in our city. Then we can mention lots of martyrs; among them Hryhory Khomyschyn, bishops of secret Ukrainian Greek-Catholic Church – Ivan Slezyuk and Symeon Lykach. Ivan Lyatyshevsky was the only vicar in the history of eparchy. There is a burial place of Sofron Dmyterko in the cathedral who did a lot to regenerate our eparchy from underground.